The Dwarf community is full of amazing, talented people. I have connected with some amazing people since I’ve picked up the metaphorical pen again. This has been especially so through Twitter and mostly has influenced the list of people I’d recommend you follow below. As a child, I never had any role models to look to for guidance, inspiration or that sense of not being on my own with my experiences. It wasn’t until my late teens and my early twenties that my Dwarfism journey began and I started reaching out. Blogging and social media were in their early days, though still fantastic for people like myself to be able to connect with others across the world in similar circumstances. The purpose of this blog post is this – to guide the curious who wish to learn more about the breadth of talent we have in the community. On a personal level, to give acknowledgement to those that have shaped my own Dwarf journey and promote the wealth of new talent coming through. Lastly, for the young person with Dwarfism desperately wanting to connect and validate their own experiences in this world. The criteria for inclusion in this list is that the person is either a) prominent on social media, b) is rocking their career and are c) predominantly UK/Ireland based. There are many voices and roles models that I want to add to this, especially internationally. The list is not exhaustive or claims to be representative of the whole community. I wanted to highlight the fabulous work those of us with Dwarfism are doing. I feel I have only scratched the surface and would encourage you to contribute your own suggestions in the comments below. Who could forget Ellie being the youngest Paralympian to win gold for swimming! Seeing a person with dwarfism achieve sporting excellence and be acknowledged for this, was awe-inspiring and gave hope to those of us that dwarfism and sport can be talked about in the same sentence, positively. Another person I met through the Restricted Growth Association (RGA), Simon has had an incredibly creative career that I followed from a distance. He is a disability consultant through his consultancy company Sminty. He’s co-produced the comedy troupe, Abnormally Funny People and currently presents the BBC Ouch! Podcast and his own podcast called The Phil and Simon Show. I first met Jo through the RGA over 10 years ago and she is now living the life as an actress in LA. Jo is one stylish lady and I often find myself looking at her Instagram feed wondering where she has purchased her latest gorgeous outfit. Personally, Jo’s feeds have made me realise that fashion and dwarfism can exist in positively in the same sentence, despite the many challenges and extra costs we incur when in the name of fashion. 4. Mary Russell – Fashion Designer, Model, and TV personality. Mary first burst onto our television screens on the show The UnDatables. With an appearance on Little Women — LA, and the BBC documentary, Without Limits, highlighting mental health issues and the differences that can be found within the disability community itself. 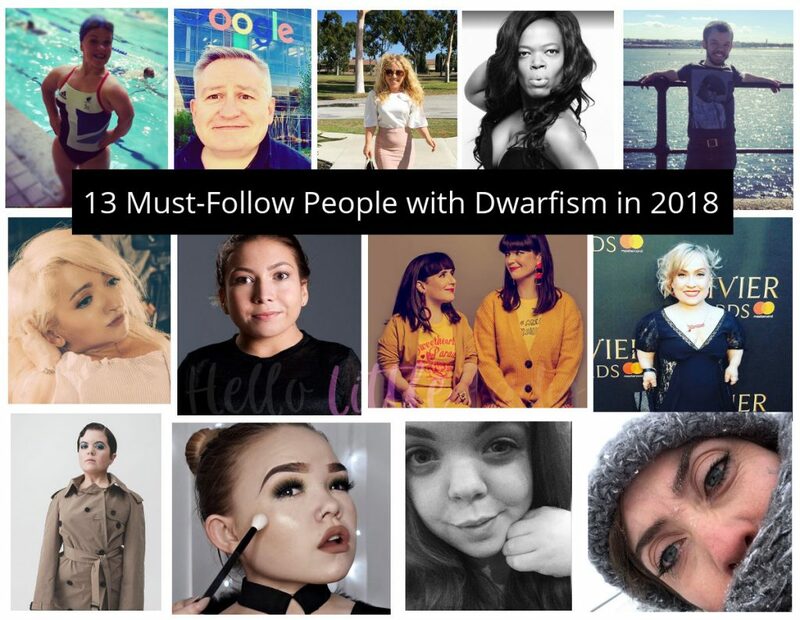 Mary has also been a Scope Role Model and is an aspiring fashion designer and regularly posts about her latest projects on her Facebook Page – Dwarfism Beautiful. Make sure you support her latest project – #MYSILHOUETTEMATTERSTOO. Now here is a gentleman taking Twitter by storm raising awareness of the social issues people with dwarfism face on a daily basis. He’s also a trustee of the Restricted Growth Association (RGA). Sinéad is fast becoming one of the fashion icons of our generation. This lady is a writer and an advocate who started blogging about her passion for fashion as Minnie Mélange. Her public speaking has taken her to Davos, to New York City with her talk on the need for inclusivity in design with her fantastic TED Talk and has also been featured most recently on the Business of Fashion front cover – The Age of Influence – Sinéad Burke Versus The Bell Curve. Sinéad has also been named as one of the 25 most influential women as part of The Vogue 25 – Meet The Women Shaping 2018.
Who could forget THAT fantastic Malteser advert?!. Samantha Renke, who moved to London, is an actress and a disability campaigner who has appeared on Loose Women and blogs over at posabilitymagazine.co.uk and the HuffPostUK. Annabelle is stepping out of the shadow of her Dad, Warwick Davis, and carving out her own career as an actress, in the CBBC programme – The Dumping Ground. Anabelle has also recently launched her own range of gifts through her online shop Tortu to showcase her artistic talents. The excellent and humorous, Lisa first came to my attention through the film “Every Time You Look At Me” on the BBC in 2004. This was the first time I had seen a drama or anything on TV where a character with dwarfism was cast as a romantic lead and reflected the challenges I too faced as a person with dwarfism. More recently, she has played Donna Yates in Eastenders and can be seen in Channel 4’s Comedy Blaps. Her latest play latest play “Still No Idea” performed with along with Rachael Spence is on at the Royal Court Theatre from 31st October to 17th November 2018. Born in Australia, Kiruna was one of the first dwarf actresses I became aware of in my 20’s. I’ve long admired her stance on only taking roles that do not adhere to the stereotypical way of objectifying dwarfism in entertainment, film and theatre. Kiruna, originally from Australia, made her professional acting debut in Baz Luhrmann’s Moulin Rouge, travelling to England to study Shakespearean and Jacobean Theatre one summer at LAMDA. Kiruna also had a part in the Warwick Davis BBC series, ‘Life’s Too Short’ and most recently, featured in a documentary, ‘All The World’s A Stage”, about her life on ABC in Australia. Georgia Rankin has taken her passion for makeup and beauty and turned into her own YouTube channel Makeup Junkie- G. Georgia has a 112k following! Georgia also recently featured in the Channel 5 documentary – “30-inches-tall-and–turning-18′. I had the pleasure of meeting Sam at my first RGA Convention way back in 2006. She has been freelancing for over a decade and a talented graphic designer to boot! Sam also has some collaborative projects up her sleeve with yours truly, which we can’t wait to tell you about soon! Danielle is a 19-year-old blogger and another YouTuber who raises awareness of dwarfism through powerful blog posts “Dear Dwarfism… A letter to my condition” and “To the parent who pulled their child away from me”. I always forward to Danielle publishing her next post. What are your thoughts on this list? Who have I missed and who do you think should be included? Name the people in the dwarf community who you admire or helped you on your dwarf journey in the comments below. Love it! Followed all. Thank you so much for this. Great list – it really has a diverse mixture of amazing people that we should all be watching out for! Thanks so much, David! Yes, we have a lot of incredible talent in our community!